I’m not long back from around the trip involving 15 different flights. And about half of them were spent without a travel pillow and spent filled with regret. So my wife bought herself a travel pillow to use, I borrowed it and fell asleep for most of the flight. Sorry! 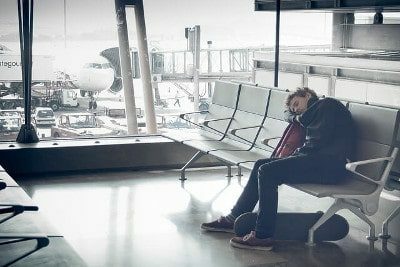 Waking up after sleeping in a plane, train or even the car can often be an uncomfortable experience. Having to slowly move your head back to its proper position all the while your neck is screaming at you. Not fun. Travel pillows solve all of this and have gotten super cheap which is a bonus. They’ve also come a long way from the inflatable neck pillows that had that horrible scratchy piece of material right around the middle where your neck went. Now we have lovely memory foam, microbead and all sorts of comfy materials. Check out the table of contents below so you know exactly what to expect in this Complete Buyer’s Guide. There are quite a few different things you need to consider when you’re buying a travel pillow. It’s nothing complicated but it could mean the difference between sanity and insanity on a long haul flight. The filling! The filling of your neck pillow is what provides you with the support and comfort you need for sleeping during travel. The three main fillings are Memory foam, regular foam and microbead. And air I suppose but I really don’t like inflatable travel pillows, I’m yet to try one that’s actually comfortable. Memory foam neck pillows are firmer than other pillows which are great for keeping your head supported. They’re great for dealing with neck pain in flight so I highly recommend pillows with memory foam. This is just regular pillow foam so very spongy and nice and comfy. Less support than their memory foam counterparts but very comfortable for a great sleep. I really like microbead pillows, they mould nicely to fit your head and neck giving you great support and comfort. They also don’t get too hot while you wear them which is a bonus for those of us who tend to overheat while we sleep. You want the outer material to be nice and soft since it will be the part that is in contact with your bare neck. The travel pillows recommended here have either a velour cover or polyester plush covers. Lovely and soft if you have it on your bare skin. This is the type that wraps around your neck and sits on your shoulders. Classic and comfortable it feels nice on your neck and lets you rest your head back or to the side for a comfortable night’s sleep. Less restricting than the U-shaped pillow Tube travel pillows are more diverse and can function as a regular pillow in other scenarios (like the bath or yoga) But they can be more difficult to get comfortable while sitting on a plane and they are more likely to fall out of place while you sleep. These are a little more unusual but can be really great for ultimate comfort and support if you get used to them. I’m not going to say too much about them here so read on to the best pillow section for more on the J-shaped travel pillow. Finally we have storage, once you’ve travelled somewhere you’re going to have to carry your neck pillow about so you need to take into consideration what you’re going to do with it. Can you clip it to your luggage or do you need to give up valuable space inside to store it? I’ve found the pillows with clips are best since you can just clip it onto any backpack or suitcase you have and then take it off once you’ve made it to your hotel/hostel/hammock wherever you happen to be staying and keep it in your room till it’s time to go. There were a fair few contenders for the best travel pillow but I managed to narrow it down so that everyone can get exactly the pillow they need. I’ve also linked them all to Amazon so you can buy yours today! See? It’s genius! That’s why it gets the Dozy Owl seal of approval. And it was invented by a mum who struggled her way through an overnight flight with her kids and decided there should be an easier way. And there is! 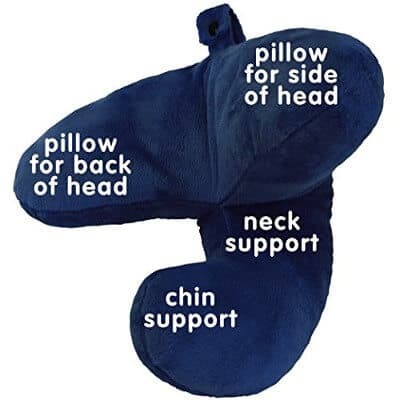 It gives you more support than a U-shaped pillow because it takes the weight of your neck by supporting under the chin but is still super comfortable. It’s also got a little clip at the back so you can easily secure it to your luggage while you’re in transit, it also boasts that it folds up to a little smaller than a U-shaped pillow which is great but it doesn’t make that much of a difference really. 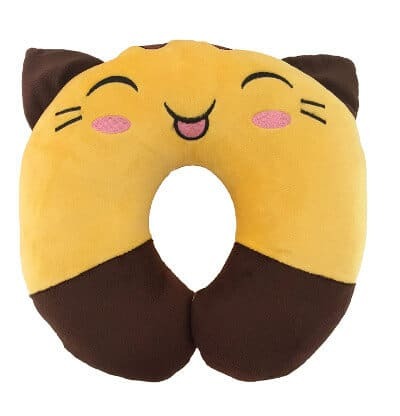 It is the best travel pillow available if you have an international flight or your travelling overnight, but it’s great for short flights as well as the train and car too! First off when you first get it, itmight have a strange smell. Don’t worry this is true of all memory foam products and goes away after you air it for a while. Usually 72 hours but 12 hours because it’s small should do the trick nicely. 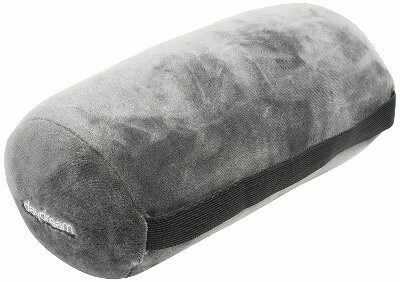 Motion Performance have a great memory foam Travel Pillow. 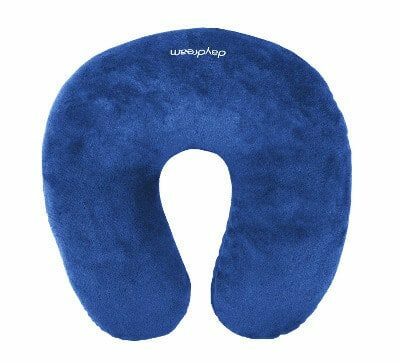 Offering superior neck support because of the memory foam it is wonderful for anyone who has real trouble with their neck while they’re watching sleeping on a flight. I like this one because it comes in a huge range of colours from obnoxious leopard print through to the plain blue shown above. It also has a machine washable cover which means you can use it for the long term! A great travel pillow for those with neck problems. 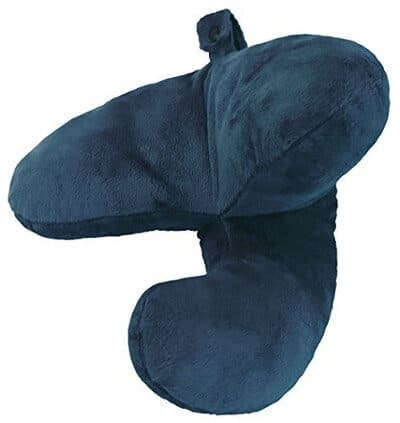 The Daydream pillow is a great microbead pillow, it has a super soft plush cover and is U-shaped to help support the neck. If you haven’t used microbead pillows before you should know that it can be a little fiddly to get them into the right shape because the beads can bunch up to one side. But it doesn’t take long to get them into the right place and the result is a really comfy well-supported pillow that helps you sleep properly no matter where you’re travelling to. The Daydream tube-shaped pillow is the most versatile because it is a great travel pillow with a nice soft cover and good moulding abilities to fit your neck nicely. But it has some other great uses too! You can use it in the bath to put your head back (Don’t let it drop in! ), or you can use it as extra knee support if you need your knee elevated in bed. Or it’s a good one to take camping as it can act as a regular pillow if push came to shove. As a travel pillow the tube shape is good for those who feel constricted by a U-shaped pillow but still need support to stop their head from falling side to side. Is this not just the cutest thing ever? I love the design of this and the other ones sold by the same person on Amazon. It’s suitable for kids around age 5 and up in terms of size and the covering is nice and soft. It’ll stop your kids head lolling about while they sleep and make them more comfortable so they stay asleep for longer. It’s a great tool to add to the arsenal of keeping your kids entertained while travelling. Nice and comfy and a great design so it shouldn’t be difficult to get your child to wear it but let’s face it, things are never that simple! Why are there no inflatable pillows on the list? As I said I am yet to find an inflatable neck pillow that is comfortable, the ones I have tried have all been too tight around my neck or have had a horrible plastic rim around the middle that scratches at your neck. If you know of any good ones that I could review and add to the list then feel free to let me know! Will these pillows make it easier to sleep on International flights? I would say yes, they provide you with more comfort and I definitely found it easier to sleep. I once sat next to a woman who decided to curl up on the floor and use her seat as a pillow. I know for sure I was more comfortable and slept better than she did with a travel pillow! My neck is too long for a horseshoe-shaped pillow what should I use? You definitely want to try out the J-shaped pillow at the top, the way it’s shaped means neck length isn’t a problem so you’ll get a better sleep and be free of neck cramp.